Sycuan Resort, El Cajon, Calif. Contractor: TH Designs, Ontario, Calif. 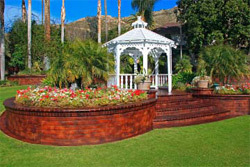 When the Sycuan Resort in El Cajon, Calif., was looking to update its wedding reception and ceremony area, the building committee knew exactly who they wanted to do the work. They had seen Tony House's work on the Concrete Solutions website and thought he was just the guy for the job. They got in touch with House, owner of TH Designs, and the rest was history. The resort wanted do something unique with its concrete sidewalks and hardscapes, which were at the time a dull salmon color. The area serves as a gathering area for golfers and wedding parties, so the client wanted to create a richer look that blended more with the surrounding landscape. House and his crew used products from Concrete Solutions to create a gorgeous masterpiece. To start, they stripped the existing concrete sidewalks with a caustic cleaner, then power-washed the solution off the surface and put down a Moisture Guard treatement. The next step was to add color. For the walkways and brick around the reception area, House used a mixture of Ultra Surface Concrete Dye in English Leather and Earthstone. For the retaining walls, House only used Earthstone. "They wanted it to stand out a little bit," he says. "It's a little bit darker in color than English Leather." After the color was set, House applied coats of Ultra Surface Stamped Concrete Sealer and Sealcoat 1000. In total, House and his crew were responsible for improving more than 11,000 square feet. "It was a pretty straightforward project," he says. "We had a little bit of a rain delay, but that was about it." Contractor: Nawkaw Corp., Bogart, Ga. Though the Hyatt Regency in Atlanta, Ga., is relatively new as far as restoration projects go - less then 50 years old - completing the work was no small task. Nawkaw Corp. was called upon to restore the exterior of the hotel, billed by the chain as the world's first "contemporary atrium" hotel. The project required thorough cleaning and faux finishing of a few areas to create the look of exposed aggregate. 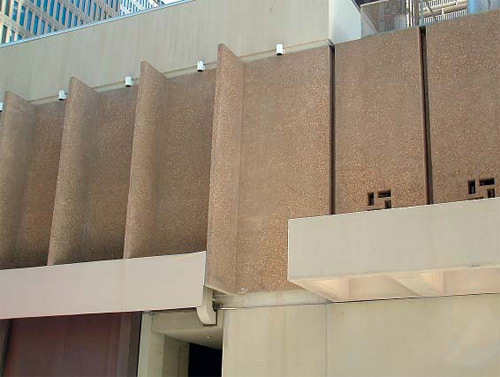 When the Hyatt was built in the mid-1960s, builders utilized cast-in-place vertical concrete, incorporating river rock from local rivers for exposed aggregate. However, according to Nawkaw's Southeast regional manager, Nathaniel Jones, there was a lot of inconsistency in the walls. "Some panels were completely void of river rock, but others had a lot," he says. In addition, he says, some of the concrete was discolored, and there had been patches applied to the surface during its lifetime. 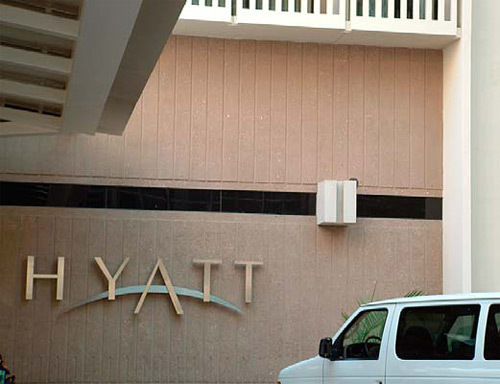 The Hyatt's goal was to not only even out the discoloration, but also to fill in the spaces missing the river rock. To start, Jones and his crew pressure-washed the surface, and after it dried, an application of Nawkaw's NWRT-91 water-repellent stain in a light tan color was applied with a roller. "We tried to spray it, but it didn't work because of the wind," Jones says. Once the stain was absorbed, the surface was pressure-washed again to remove the excess stain. Working their way down the building, they began to do faux finishing work where the missing aggregate was visible to the pedestrians on the sidewalk below. To do so, they used three different sizes of custom river rock templates from Modello Designs to give color and texture to the area. In all, Nawkaw was responsible for restoring some 70,000 square feet during an 8-month span. Because the building soars 27 stories into the Atlanta skyline, working at the upper levels proved tricky. The crew had to access the higher elevations with swing stages via roof access. Thankfully, Jones says, project engineers were able to assist with the logistics. In addition, much of the cleaning work on the lower elevations had to be completed at night. Once the cleaning was complete, work was allowed during the daylight hours, but there were still restrictions limiting the crew to early morning or late evening hours. As a final challenge, Nawkaw also had to close off a busy street in order to safely complete some of the work. "It was a challenge to figure out the best times to close the street and redirect traffic and pedestrians," Jones says. It appears that all that the team's hard work paid off. The project took first place for restoration at the 2006 Dan R. Brown Awards, given out by the Georgia chapter of the American Concrete Institute. 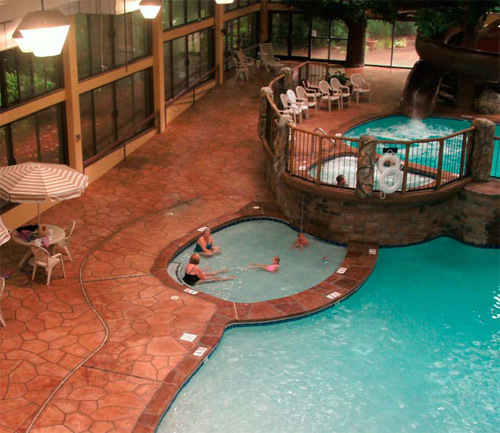 The Park Vista, Gatlinburg, Tenn.
As part of an $11 million renovation, The Park Vista hotel in Gatlinburg, Tenn., gave its indoor pool area a major facelift. The 300-room Doubletree property is nestled in the Great Smokey Mountains, and the owners wanted to create a private water park attraction for their guests. In order to complete the project, the hotel contacted Bill Mackebee Sr. with Pools by Bill Inc. The Lenoir City, Tenn., company has been in the water park business since 1954, and it would serve as the general contractor for the 15,000-square-foot area, which features rock caves, multiple slides, two pools and even concrete trees. To start the deck work, Nick Powell and Reflective Floor Treatments Inc., Powell, Tenn., removed most of the old deck's surface using two HTC 800 Classic grinding and polishing machines outfitted with T-Rex tooling. Next they ground to 80 grit to further smooth and level the concrete. To reach some of the corners and pool copings, Powell and his crew used a 7-inch cup grinding wheel, also from HTC. Although this would typically be a cut-and-dried job, the Reflective Floor Treatments crew faced some challenges, as the floor surface was not flat. "It had some sharp changes in elevation, and it's not real common for these grinding machines to work on a floor with such an angled surface," says Reflective's Chuck Powell. With the surface prepped, it was time for Paul Spurlock at Signature Concrete Products to apply a concrete overlay to the pool deck using Specialty Concrete Products' Stencil-Crete Resurfacing System. He first had to use the overlay material to repair some of the pool copings, as Pools by Bill had installed a couple of plumbing trenches. Spurlock applied polymer-modified Stencil-Crete Mix in an Adobe Buff color with a trowel and hand-carved the copings, adding Sun Gray-colored Stencil-Crete by brush to the carved areas to recreate the grout look of the existing copings. 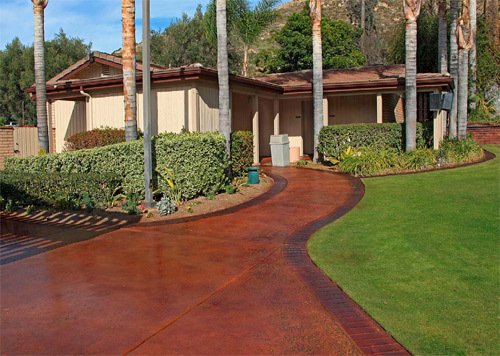 The surface was then sealed with SCP's Chrome-Seal 30% Solids Clear Sealer. Once the sealer dried, the parts colored with Adobe Buff received two applications via foam roller of Walnut-colored SCP Stone-Shade Liquid Antiquing Agent. For variation in color, some of the "stones" received heavy or light coats of color, and the surface was again sealed with an application of Chrome-Seal. Once the copings were repaired, it was the original copings' turn. They were pressure washed and given an application of Chrome-Seal. One coat of Stone-Shade in Walnut was applied with a foam roller, and some of the "stones" received an additional application for variation. They were finally sealed with Chrome-Seal. "This technique was required to match the colors of the existing pool copings and the newly created pool copings, because the Adobe Buff base-coat color did not match the base color of the existing pool copings," says Spurlock. "This technique worked beautifully on this application and created about four different shades." With that complete, Spurlock moved on to filling in the seams and plumbing cuts with a crack weld repair system from SCP, treating them just like cracks. Next the crew pressure-washed each section, and once it was dry they troweled on Adobe Buff-colored Stencil-Crete and hand-carved a flagstone pattern. The crew applied one coat of Chrome-Seal, then applied one application of Walnut Stone-Shade with 4-inch foam rubber rollers. To finish, another coat of Chrome-Seal was applied. Because the pool renovation was done on such a large scale, there were many different workers in the area at any given time, so Spurlock, Powell and Mackebee Sr. all had to work around other contractors. As a result, each could only work on a small section at a time. Spurlock was able to rise above the challenge, however. "I'm used to doing that," he says. "I come from a commercial background, and the general contractor would always use the flooring contractors to push the other subcontractors out of the way so they wouldn't have to cover the floors to finish their work." Although the project ran over schedule, Mackebee Sr. is quite pleased with the outcome. "Everything about it is just completely different," he says.